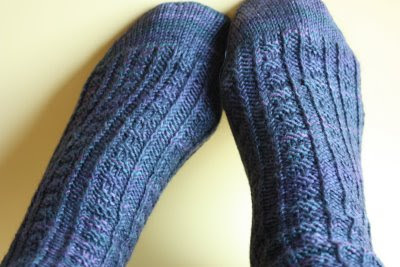 I started these socks a while back and finally finished them. These are too big for me so they will go on my stack of give-away socks. That stack is quickly growing as you can see from the picture above. 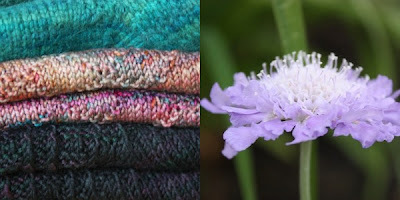 I am a bit bored of dark colors right now - it's summer and I think I am in the mood to knit fun, brightly colored socks a la yarnstorm. I have a wonderful week coming up. I am on holidays for the whole week. The Calgary Stampede starts on Friday, July 4 and I want to avoid the downtown like the plague. There honestly is nothing worse than the Calgary Stampede. It is a time when otherwise absolutely normal people dress like cowboys, drink excessively and do things they would normally never think of doing. However, this event is sacrocant in this city so those of us who abstain from watching little cows get roped by the neck and dragged by a horse typically try to either leave town or stay away from the hundreds of Stampede events that one is forced to go to as part of 'networking'. I plan to stay home, work on my garden, do some knitting, go climbing and just relax. Pure bliss.